So have been throwing around the idea of a plasma cutter. It would cut down on build time for sure. It sure would beat using a cut off disk on a grinder. I have been looking around on the internet a bit. I have Lincoln welder and it works great. I was checking miller, hypertherm, hobart. Does any one have a suggestion? or one they like to use? can't drink all day if you don't start in the morning! Ah, I have been looking for an excuse to get one also. I do some pretty large projects and repair my own farm equipment but just couldn't bring myself to get the Plasma after buying a new Miller 212 Mig last year. I am looking at getting the Miller Spectrum 375 X-treme. It has auto sensing input AC. I just ordered one from Longevity. Its due to arrive Friday so cant attest yet to how well it will perform. Its similar to the Miller Spectrum 375 for about 1/2 the price with a 5 year part and labor warranty. I think its 3/8 inch cut and 1 inch sever (I like you looked at a ton of them) for $399 w/o pilot arc and $500ish with. I ordered an LP-40D w/o pilot arc. If you havent bought one by Friday, I'll let you know what I think if you're interetsed...assuming Santa (UPS driver) delievers ontime! I got the barebones no frills one...just want to cut something up. Been telling folks at work to be nice, I can cut their car in half now. My plan is to stop playing with sheet metal and drums and get into some plate. Good luck hunting...biting that bullet is exciting. mtrammel, that is a pretty dang good price on those units. How's the cost of consumables on them? I see they have only been in the business for 5 years and explains why I never heard of them. I will be curious to hear your review of this unit. Also please let us know what your opinion of the quality of the overall unit. Anything you don't like and things you do like. I am hesitant because of my past experiences with not buying a quality name to begin with. With the warranty and these reviews and a 30 day no questions money back...I bit...hopefully optimistic at this point. A 30 piece large kit for this model is $89. Sorry, smokin ernie, not trying to hi-jack anything here. Hope this is helpful info. The miller one does look very nice as well. It is so hard to decide and I agree with purplewg that not getting a good brand name does kind of scary me. However a friend bought a 4.5 grinder from harbor frieght and it has been used very hard and still keeps going and it was only 20$ and it cut and grinded a lot of metal. Funny you mention the HF grinder. I went through two in one week. I went and bought a Dewalt and 3 years later still working like a champ. My Makita 4.5 grinder is 20 years old and still works great but it starting to sound funny. It might need new brushes. Funny. I've stated with a $16 harbor freight as well. Could tell I was torq'ing it a bit so one of the reasons I went the plasma direction. I took both of those grinders apart and discovered they had used some grease in the gear box that was consistent with shoe wax polish. It slung off the gears and onto the sides and there wasn't much of it. mtrammel dont worry about it. I enjoy the opinions everyone comes up with and I am always interested in learning new stuff. Beside next to smoking what better to talk about then tools. As I find new info I will pass it along. Thanks again guys very helpful! The consensus among pro welders is to stick with Hypertherm or Thermal Dynamics. Reason is parts support and repairability. I've been very happy with my Thermal Dynamics plasma cutter. Didn't they invent these things? Hypertherm is the way to go, they actually used to make Miller's machines for them. Parts can be found anywhere, they have service centers if you need them. Longevity,and Everlast are two companies I would stay away from. Those guys fight like 2 school girls over on the welding site. If you insist on a Chinese machine to save money, get one from Harbor Freight where you can return it when they thing kicks the bucket in a few days. Head on over to weldingweb.com if you need some guidance and you can see what kind DOA percentage they have. That being said, I have a PowerMax 30, its dual voltage, and it cuts far beyond its rated specs. 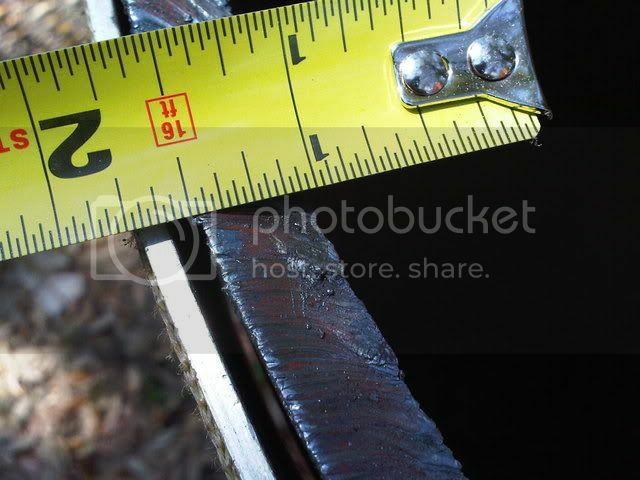 It is rated to sever 1/2" which means barely burn through, then look at this cut. Thats just a hair under half inch, and the cut is spectacular. Thanks some great info. I was reading that some machines are under-rated and are able to cut more then stated. I think black pearl has a good example of that. I will check out the weldingweb thanks! I am a member of weldingweb under the same screen name. Posted a question asking for advice before I bought the plasma cutter....silence. Been days and not one reply. Its not like our community here on the Ring. Had I known...maybe I would have gone a different direction. IMHO, appears the best info on welding comes from this Cookers forum on the Ring... much more responsive community. Wish I had posted this question here before pulling out the card and placing the order. I learned more here and it lead me to get my Hobart Handler thanks to input here...should have known. Hope I havent created myself a headache with this Longevity machine. Once I'm rich and famous, well mainly rich, all my gear will be Miller (or at least Miller's Hobart) also. mtrammel- Hopefully Longevity will test the machine before they ship it, about 90% of the problems I have seen are DOA issues. They will ship you another one, but thats just a whole lot of BS I have no interest in dealing with. If I were you, I would call them and make sure they test your unit. There are some forums where the guys know more about the machines then Longevity and Everlast do, they can tell you whats going to burn up and how to repair it, and make it better. I don't remember the sites now, I have only ever been linked to them on occasion never actually joined. But I know some of the guys are switching the capactiors and various other simple soldering projects and getting much better results. If anyone needs any assistance with plasma cutting or understanding the lingo let me know. Heck, anyone in the Tampa area that needs cutting done just let me know, I'm always down for a build.